It's the road trip season, and just as parents make sure not to hit the road without asking if their children have used the restroom, those traveling with horses should be asking themselves, "Am I road ready?" Traveling with horses may require specific gear depending upon the intended activity: trail riders may want to bring hobbles whereas calf ropers may want to bring leg wraps. In either case, traveling with horses still requires packing many of the same essential items such as feed, water, shelter, and first aid supplies. All kinds of things can go wrong while riding or competing that horse owners often prepare for, but ensuring safe arrival to the destination is just as important. This means making sure that the truck and trailer are prepared for hauling. U.S. Rider, a 24-hour nationwide roadside assistance company for horse owners, provides a "Don't Go On the Road Without It" Checklist when traveling with horses. U.S. Rider also reminds travelers crossing state lines to bring a certificate of veterinary inspection (health certificate) dated within the last 30 days, proof of negative EIS (Coggins) dated within the last year, and a certificate of brand inspection (if applicable). Many of the items on the checklist may be second nature to an experienced driver, some may have been stowed away in a trailer years ago, but years of experience trailering horses also brings years of advice for novice drivers. Gillette College Rodeo Team's Jordan Thurston, goat tying/breakaway/barrel racing competitor from Lance Creek, WY, has been trailering horses most of her life and has picked up a few tips along the road to share with those preparing to be on the road. 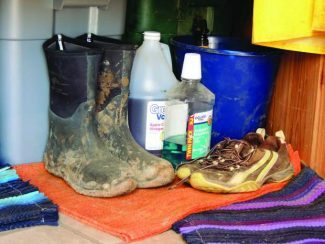 When asked what she would never leave home without, Thurston named bute and water buckets as two of her essentials and then added, "And horse treats, because my horses are spoiled." She also travels with blankets year round because she said, "When traveling with weather like we've had the last few days – windy, cold, and rainy – my horses could at least be dry." Another trick she's picked up over the years is keeping Listerine on hand which can be used as a disinfectant for cuts and scrapes. Thurston also started travelling with portable panels after her horses incurred swelling in the hocks and ankles after stalling at event locations. She explained, "I never stall my horses at home, so when they are stalled, it's hard for them." Instead of dealing with swollen and sore horses, Thurston began carrying panels in her truck saying, "That way I can put my horses in a big pen so that they can move around and won't stove up." When possible, Thurston prefers to travel with a "buddy horse" to keep her horses calm on the road, describing her horses as being "obnoxious" sometimes without one; but what she really worries about while on the road is her horses getting hurt in the trailer. "They need plenty of room," she said, "and if that means having to ride someone else's horse when traveling to keep a horse from getting kicked, so be it." 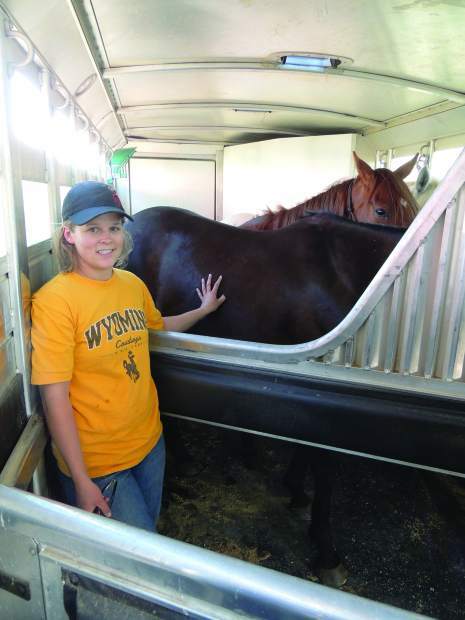 Thurston maintains a clean, safe trailer for transporting her horses: doors are equipped with safety latches, sides have removable plastic panels to let air in or shield horses' eyes, and horses are never packed too tight in her open (or optional slant) trailer. 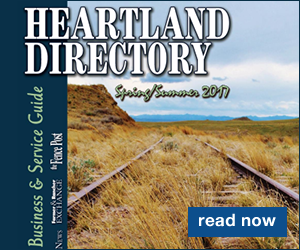 Many tips and tricks are picked up over the miles spent on the road for horse owners and vacationers alike. Some may be so small or simple that they may be easy to forget. 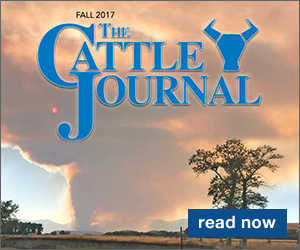 With that in mind, Thurston shared one more item on her checklist that she always has with her when she is on the road, "Always have your vet's cell phone number on hand and know where to go for colic surgery." She pointed out that not all veterinarians perform this type of emergency care and it could be an awful waste of time to drive to your local vet only to find out that you should have gone the opposite direction to an emergency facility. Being prepared is the best way to be ready for the road.